An interesting building which has been up for sale this summer is the Bishopswood Tower. This was built as a folly tower and gamekeeper's cottage on the Bishopswood estate. It is stone-built with battlements on top and rises to three storeys with a higher stair turret adjoining. It stands on a hill just over the Gloucestershire county boundary in Ruardean parish and looks down to the wooded valley of the Bishop's Brook, which forms the county boundary here. It also looks down to the site of the demolished Bishopswood Mansion. The Bishopswood estate was bought in 1801 by William Partridge, a wealthy ironmaster originally from Ross, who already owned the nearby Penyard estate. The Bishop's Brook had long been the site of ironworking. In the early 1820's William's son John, also an ironmaster, had a Tudor-style mansion built in a natural amphitheatre above the southern bank of the brook. He must have been a man of means because he employed Jeffrey Wyatt as architect. Wyatt was in the top league of fashionable architects and about the same time started work on enhancing Windsor Castle for King George IV, after which the King authorised him to change his name to the grander sounding Wyattville. 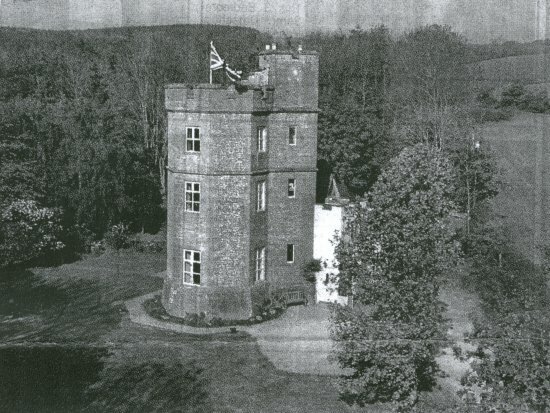 In the relevant "Buildings of England" volume the Tower is dated to c. 1846, but it appears to be shown on the skyline behind a picture of the house included on an estate map of 1844 (reproduced in "A History of Walford and Bishopswood" by Virginia Morgan and Bridget Vine). Therefore it could be earlier and, if so, could have been designed by Wyatt at the same time as the house. Its "toy fort" style of architecture is certainly reminiscent of the way Wyatt embellished Windsor Castle to create the skyline familiar to us there today. Whenever the Tower was built, it certainly formed part of the picturesque sensibility which prevailed on the Bishopswood estate. Back in 1770 when the Rev. William Gilpin made his famous "Observations on the Wye" he had given it little notice. As he travelled down the river he observed only that "on the left the furnaces of Bishop's-wood vary the scene, though of no great importance in themselves". However by the early nineteenth century ironworking on the site was being phased out and what remained provided a perfect setting to realize the picturesque ideal. The winding brook in its steep valley, a string of man-made pools, the woodlands interspersed with pasture and, of course, the Tower on the skyline above, all provided John Partridge with a smaller version of the Downton Gorge in North Herefordshire, also an ironworking site and the home of Richard Payne Knight, famous writer and advocate of the Picturesque Movement. The Mansion was destroyed by fire in 1873, was rebuilt but was demolished after another fire in 1918. (The present Bishopswood House is further away near the Church and was formerly the Vicarage). However, the Tower still stands, now accessible only via a Forestry Commission track. It was fitted out and used as a four bedroom holiday home and then was up for sale in 2002 for £375,000. However this year, having been renovated (and having seen 5 years of rising house prices) the asking price was £850.000.